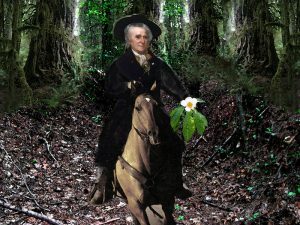 In his Travels, William Bartram describes what I consider to be the three most elusive episodes in his journey from South Carolina to Cowee Town in 1775. These accounts include meeting the Cherokee strawberry-picking maidens, whom I am convinced he encountered on Green’s Creek just east of Cowee Bald. 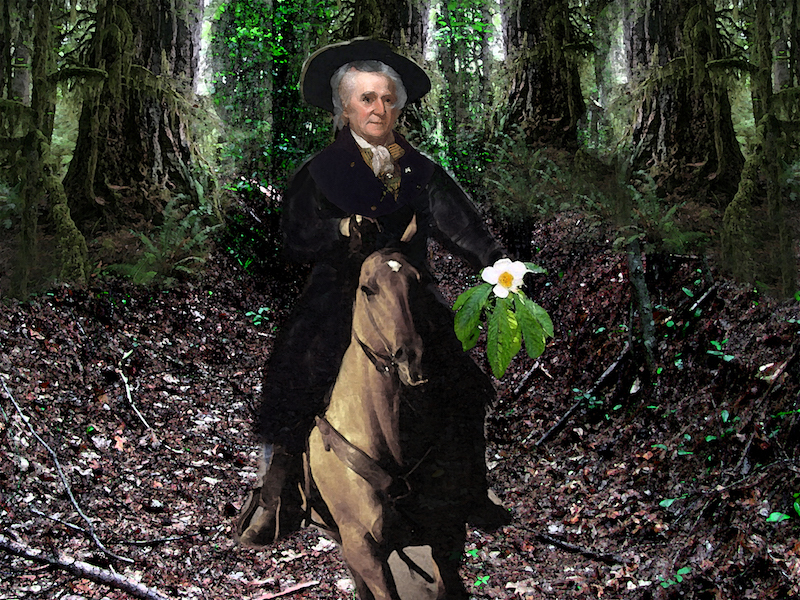 The second mystery is his traverse across the Nantahala Mountains, where he met Cherokee Chief Attakullakulla. The curious fact that Bartram did not pass through any of the Valley Towns after travelling for so long and so far makes it difficult, if not impossible, to map this section of his route after he ascended Nantahala Mountain at Burningtown Gap near Cowee Town. The third of these most elusive and contended geographical mysteries is that of Bartram’s Mount Magnolia and Falling Creek. 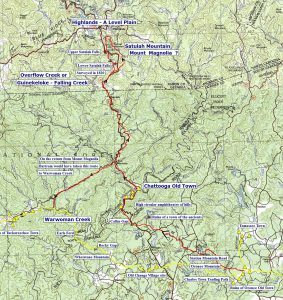 I am certain Pinnacle Knob and Martin Creek near Clayton, Georgia cannot correlate with his actual route. Let’s examine some facts concerning Bartram’s travel from Oconee Mountain in South Carolina to Mount Magnolia. The route from Oconee Moutain to the Highlands. After leaving Seneca Town, modern Clemson, SC, Bartram traveled north to Fort Prince George, which at this time was used as a trading house. He spent two or three days there waiting for an Indian guide that didn’t show up. Alone, but evidently armed with much information from the traders who were familiar with the Cherokee country. He left Fort Prince George, forded the Keowee River at the site of Keowee Town and followed the trading path to the site of Oconee Old Town and Oconee Mountain. Bartram was following a well-documented and popular road known as the Charles Town Trading Path or the Cherokee Path. From Oconee Mountain this path crossed Whetstone Mountain at Rocky Gap and forded the Chattooga River at Earls Ford. From the ford, it followed Warwoman Creek west towards Clayton, Georgia. This route was followed by the British Army in 1761 shown in great detail on a map made from the expedition. It also is detailed in many journals including those of 1796-97 Benjamin Hawkins and the 1776 Andrew Williamson expedition. Those who have attempted to reconcile Bartram’s geographical route from Oconee Mountain to Earls Ford and Warwoman Creek on the Charles Town Trading Path have exercised great “geographical liberty” as his account does not support that theory. It is much more feasible that Bartram left the Charles Town Trading Path near Oconee Station and took the right fork along Station Road, an old Cherokee trail, along the crest of the mountain where he explored the highest point, then descended the mountain on a main trail that led to Chattooga Old Town at modern-day Russell Field, at the conjunction of the Chattooga River and the West Fork of the Chattooga. Bartram described the ruins of an old town on the Chattooga River. Chattooga Old Town is the only historic Cherokee town found on the river in this area. Bartram also described several miles of flat bottoms near this town, and the Earls Ford area is rugged with no bottoms or town sites. The route Bartram followed was a path that connected Oconee Old Town with Chattooga Old Town; both of these towns were destroyed by Creek Indians in the 1750’s. 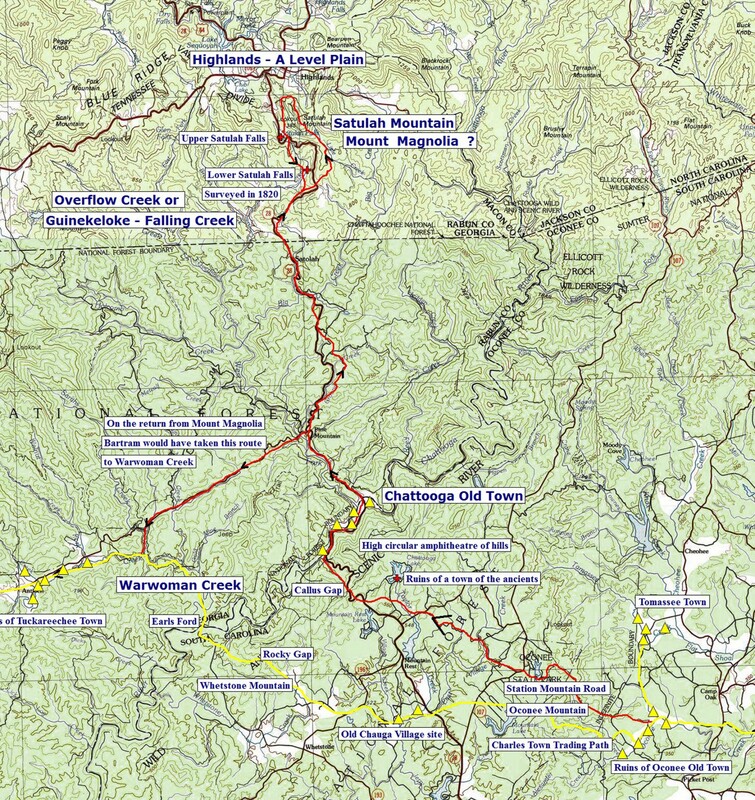 The modern description of the route from Oconee Mountain would be across Oconee State Park between the two lakes; thence across East Village Creek; near Bethlehem Church; across Taylor Creek south of Chattooga Lake; up to Callas Gap of Chattooga Ridge and down to the Chattooga River downstream from Russell Bridge and Field. From Chattooga Old Town, it is clear that Bartram rode to the top of the Blue Ridge escarpment where the waters of the Little Tennessee River separated from the waters of the Savanna River. Pinnacle Knob does not fit his description of being on the summit of the Blue Ridge. So, where did he go? To solve this mystery, or to at least narrow down the potential possibilities, we find in the 1820 Survey of Rabun County, Georgia, that the West Fork of the Chattooga (near the present-day state line between South Carolina and Georgia) was known as Guinekeloke Creek, a Cherokee word that is from e-gwo-ni (river or stream) and ga-lo-s-gv (falling) or Falling Creek. The Anglo corruption of the name became Overflow Creek, or Flowing Over Creek. This is indeed a good name, as there are about eighteen named waterfalls and cascades within five miles north of Chattooga Old Town. Clear Creek Fork (called Silver Run Creek in 1820) of Overflow originates at Satulah Mountain in Highlands. Upper Satulah Falls is located at the base of Satulah Mountain and is a cascade of 100 feet. Less than a mile below the upper falls is Lower Satulah Falls, or Clear Creek Falls, also 100 feet high. Between the two falls, there is an 850-foot drop in elevation. Bartram ascended up the mountain from the south side and went down on another side. To his right, he described a level plain. There are very few level plains on crests of the Appalachian Mountains. The Highlands Plateau is a very unique geographical area. “I perceived at some distance before me, on my right hand,” Bartram later wrote, “a level plain supporting a grand high forest and groves.” Highlands is noted for its “primeval forest.” The last remnants of this forest are protected today. After this, he rounded the west base of Satulah and discovered Falling Creek. The Cherokee trail from modern Highlands follows close by Upper Satulah Falls or Cascades and the over 850-foot long ravine down to Lower Satulah Falls. Bartram descended the Blue Ridge and intercepted Warwoman Creek, where he continued on his way to Stickoa Old Town. There remains the possibility that Bartram left the Chattooga Old Town ruins and made his way up to some other mountain peak on the Blue Ridge above Overflow Creek, but none seems to fit his description as closely as that of Satulah Mountain. And I, like all historians, reserve the right to change my mind when new material arises from the dusty archives of time.